This image shows the polar region of Venus, at a wavelength of 3.8 microns. The arrows denote the motion of the atmosphere around a center of rotation (marked with a white dot). The center of rotation is found to be displaced on average by about 300 km from the geographic south pole. A giant vortex at the south pole of Venus is actually a shape-shifter that changes form at least once a day, at times bizarrely taking on the appearance of a giant letter "S" or the number "8," a new study reveals. The vortexes cannot really be called storms, as scientists have seen neither rain nor lightning in them. This image shows thermal infrared radiation (at a wavelength of 5 microns) emitted by the cloud tops at the southern polar region of Venus on Jan. 20, 2008, as viewed by the VIRTIS imaging spectrometer on Venus Express. The white arrows show the atmospheric winds, measured by tracking the movement of cloud features. "Filaments swirl around one or two bright — that is, warmer — centers," researcher David Luz, a planetary scientist at the University of Lisbon, told SPACE.com. "Sometimes the shape looks like an S or an 8, sometimes it shows three bright centers, but mostly it's irregular." The vortex is not poised directly over the south pole, but instead its center is consistently located approximately three degrees of latitude away, and it drifts around the pole, completing a circuit every five to 10 days. 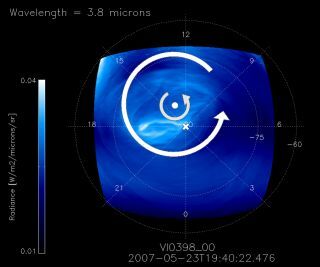 "This is a change in our understanding that general circulation models of Venus will need to take into account," Luz said. The researchers suspect the vortex at Venus' north pole acts similarly, "but for the moment we don't know, because Venus Express' highly elliptical orbit brings it too close to the north pole, making it impossible to do similar imaging studies," Luz said. "We can see only a very small region." Europe's Venus Express orbiter has been studying Venus since it arrived in 2006. The scientists detailed their findings online today (April 7) in the journal Science.